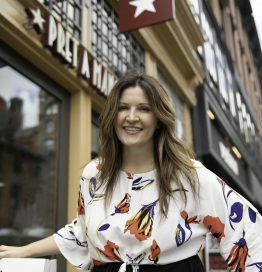 Jo Brett, US President, leads Pret A Manger a “ready to eat” food & coffee concept founded in London which offers freshly prepared food and organic coffee with over 500 locations worldwide. Jo has been an integral part of the growth of the global company for 21 years. She began her journey at Pret as an Assistant Manager in London and moved up the ranks to now lead the brand across the US with a vision to bring joy through food and coffee. Having spent several years leading over 250 Pret shops across the UK including airports and transit hubs, Jo has a strong background in Operations, Business Development & Strategy. Pret US has grown from 48 to 91 locations during Jo’s 4 years of leadership, including expansion into new cities and opening Pret’s first 2 US franchise locations at The Wharton School and University of Chicago. A motivational leader, Jo believes good people are the key ingredient to any business and is passionate about providing opportunity to every Pret employee. Jo is also the President of the Pret Foundation, Pret’s non-profit that supports food rescue organizations alleviating hunger and homelessness in the US which has helped donate over 5 million meals to those in need.